Raptivity is exhibiting at Learning Technologies 2013 at stand #14. Learning Technologies is being conducted from January 29 till January 30th 2013 at Olympia, London. The Learning Technologies exhibition, now in its 14th year, is Europe's leading showcase of organizational learning and the technology used to support learning at work. And it continues to grow in importance, value and attendance year on year. Manas Ghate, Sr. Manager - Business Development along with our partner P4You will be at Learning Technologies on both the days. We are excited to meet Raptivity users at Learning Technologies. Come and visit stand #14 to know more about what is latest in Raptivity. Raptivity has added various interesting interactions like ‘Mind Map’, ‘Rapid Check’, ‘Mine the Gold’ and ‘Character Dialog’ as part of Raptivity Evolve a special initiative for its premium customers. Do join us on the booth to experience all these and many more interactions on iPad yourself. 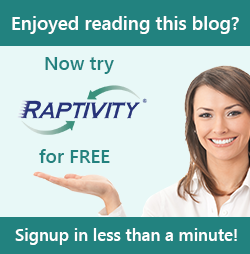 Raptivity is giving away exciting prizes. Don’t miss an opportunity to try your luck at winning ‘Microsoft Surface’. Do come and meet Manas and P4You executives at Learning Technologies, Olympia, London on Jan 29 and Jan 30th.